The above photograph served as inspiration for the following story. 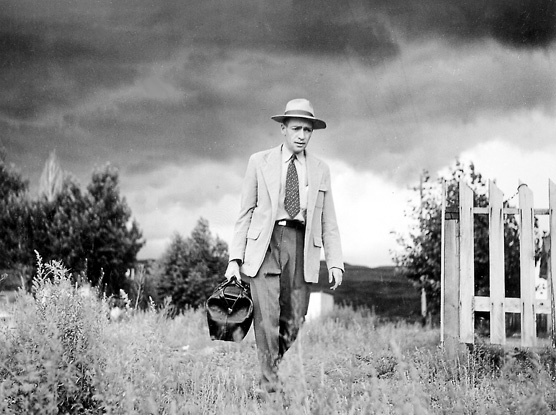 It was taken by W. Eugene Smith for the series “Country Doctor” in 1948. Things really hadn’t changed much since they’d arrived. Everyone had thought the world would be so different, so new. But people still had to make a living, and he still had to send that check to his ex-wife every month. “Another day. Another door,” he thought to himself. That was the company’s mantra. Indeed, he had no pretensions about being a bottom-feeder, a door-to-door personal ad salesman, profiting from the mostly tragic announcements people had to make. But after the invasion, when all the nut jobs and fanatics had gone to work for the new government, and the dissenters had been, well, assimilated, all that were left were people like him, and he didn’t much mind that. It made the job easier, talking to people who knew this kind of life. They would give him a few bucks to write a couple of sentences for the local paper, announcing the menial events of their daily lives to the world with the hope that long-lost family or friends would read the ad and maybe reconnect with them. It was a desperate gesture that no one took very seriously anymore. After all, without phones or the internet, or even plain old mail, what chance was there? And yet they kept paying him in tokens of two or three dollars. Then the next day he would give those couple of dollars right back to them to pick up a newspaper, to buy milk or a beer, or to mend his shoes. Besides what he could save to send to his faraway wife, none of it mattered, and he didn’t much mind that anymore, either. Not all the ad salesmen were willing to advise their clients like he was, or actually take a moment to think about the implications of the words on a page. Too many of his clients dropped off the grid for months because other salesmen had convinced them to buy unnecessary communiques, tipping them over the limit. (The worst time had been when the milkman had exceeded his limit: the entire town went without milk for a month, including the kiddies. When their milkman was returned to them, they found him collapsed in his driveway, weeping over a month’s worth of rotting milk. The crates were stacked neatly by his truck, their contents alive with putrefaction.) No, maybe he wasn’t a real bottom-feeder after all. He at least had some compassion for these people who climbed the same silent hills every day, who had quietly and nobly accepted their lives as small cogs in a pragmatic machine. Priya I really enjoyed reading this. You write beautifully!